My Kid is 2 Years Old. Can He Ride a Scooter? How Long Will the Scooter Last? Scooters are for everyone as toddlers, teenagers and adults all of them have their own kind to ride. These toys are designed keeping in mind the size and age of the rider. Ride on toys for kids are different to those for toddlers and very young babies. These tend to be different again for those for teenagers or adults. Of course, children are newbies and they are just scooting for fun so theirs are more focused on safety and stability. As a challenging level up, you can look into balance bikes for your toddler. As a parent, you are responsible for the safety of your child and naturally, you would want the best product for your toddler. Before getting into the buying process, it is important to know everything there is to know about these products. Our review will help you in choosing the top product in the best possible price-range. Any toddler, whose first scooter would be this, will surely enjoy scooting. It has got a wide base to provide the necessary support for your child. Babys as young as two and a half can easily ride it. To provide more stability and ease of steering, the front has two wheels. The grip handle is ergonomically designed and the whole thing can bear up to 50 pounds which is more than enough. It comes in two colors: pink and red so both girls and boys can push it. Your tot will learn to balance in no time with this thing. Why We Liked It: It is a very safe push which is the first priority for all parents. The turning radius is designed in a way to provide extra safety when your tot maneuvers it so they learn very fast. This one is a very sturdy model for a mini kick scooter. Its structure is made of strong steel and aluminum while the base is made from high-quality plastic (Polypropylene). It is a three wheel game with two wheels at the rear end for stability. It is foldable with an easy fold mechanism that makes it super portable. You can easily fold it and carry it in your arms or put in the boot of your car. It also features soft foam handle grips that are perfect for the delicate hands of your toddler. It is not only strong but very flexible as well. Why We Liked It: The wheels are very strong and look absolutely fantastic. They are transparent with orange colored core matching with the handlebar. Made from urethane, they are going to last very long. Your baby tot will love the color and the wheels. The YBIKE GLX is a great choice for newbies learning to scoot. It is a solid three wheel toy that is a smooth ride and well-balanced. It has a wide ABS reinforced deck to provide support for your little ones. The deck also features raised grips for additional grip. It is perfect for baby tots from 2-5 years old and can withstand a weight limit of up to 44 pounds. The rear wheel is extra wide to match the stability of the two front rollers. The bars made from aluminum ensure that the structure is not heavy. Why We Liked It: It can rightly be considered a toy’s version of Dory from Finding Nemo. The colors blue and yellow match the famous fish character. The black grips on the deck make it even more like it. If your toddler watched this movie, he or she will probably think it is the same fish. You know you are getting something high quality when it is designed in Switzerland. 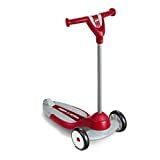 The Micro Maxi kick scooter is a superb product for tots above 5 years up till 12 years. The micro Minis are great for younger children. The wheels are made of top quality PU and are suitable for even rough surfaces of urban areas. This is the toy that brought out the lean to steer technology. Another great thing about this type of scooter is that it’s parts are replaceable. If you have more than one tot, this can probably be ridden by all of them as one grows up. The T Bar is quite tall with 22 inches height. Why we like it: There is a wide array of colors to choose from in this Micro Maxi kick scooter. There is black, aqua, purple, red, blue, green and orange. Whatever color your baby likes they can choose. It looks very cool and the push is smooth, too. This is a very fun mini scooter that is also a teacher, so to speak. Appropriate for very young babies, it has three different shaped buttons. It has 50 learning songs that will teach the children about numbers, shapes, alphabets, and phrases. There are three stages so the rhymes advance as your child grows and learns stuff. It is the perfect blend of fun and learning for a growing child. The motion switch turns the songs on as the baby pushes it with his legs. It is a sitting so all the more comfortable and good for children who have yet to walk. Why we like it: What is not to love in this cute little toy but we especially love the buttons with different shapes and symbols that children will love pressing and playing with. And that does not mean it will not last long, it is designed to follow your baby as he or she grows. If you have got a princess in the house, she will especially love it. It has bright pink wheels and handgrips with a black body. It is a three-wheeled product with the front bigger in size. The deck is quite low so as to provide a good balance. Lean to steer provides better control when maneuvering. It is good for children ages 2-4 years. The thing only weighs 5 pounds because of its plastic structure. It comes assembled so no hassle of assembly. Why we like it: It is simply great value for money because of its very cheap retail amount. You get something similar to that from famous brands in a retail tag that is super affordable. Baby tots would grow out of it soon so buying something affordable makes sense for parents. Globber’s toys and games are a good choice if you are looking for something that your child does not outgrow soon. It has an adjustable bar so it can be extended as your child gets taller. For this reason, it is also designed to withstand a weight limit of up to 110 pounds as the deck has steel plating to provide extra strength. The youngest age suitable for this is 2 years. The height works with a 3 position latch system with the lowest height being 19 inches and highest being 23 inches. The disks are made from high quality PU to match the overall strength. See the Globber Primo as an alternative. Why we like it: It has a secure direction button lock that is very good for baby tots learning to balance in the early stages. It basically locks the steering so your kid does not fall when steering and practices riding it and balancing it. The Radio Flyer scooter is very exciting with its all red look and shiny chrome handlebars. It is essentially a four wheeled toy with a seat that is adjustable so it will grow with the child. It has a strong steel frame and is designed to be durable. In this context, they have also included a bumper on the front to protect it from any walls or obstacles your baby might run into. This is important because safety is essential in even three or four wheeled rides that are usually considered safer as compared with two-wheeled toys for babies. Why we like it: It has a tiny bell on the handlebar that babies would just love to ring while they push. This is usually there on bikes but with this in hand your kid would be even happier to push it. This one has a very creative design with a curved bar. The gist of this design is to give the rider more space especially when leaning. It essentially has all the features from the GLX including the Lean to Steer and raised grip on the deck. Appropriate for baby tots aged 2 to 5, this can withstand the weight limit of up to 44 pounds only. Just like the GLX the construction and rollers are solid and sturdy. The rubber grips provide stiff grip which just adds to its many qualities. It will help your kid develop a liking for scooting and they may even become pro riders one day. Why we like it: The design and colors are absolutely adorable. It comes in two popping styles that mix some bright hues: Raspberry and Turquoise. If a kid is riding something, it should be fun and filled with colors and that is exactly what is going on here. This toy is made with tough steel, aluminum and carbon and is designed to last long. It has an adjustable T bar handle that uses a lock to adjust the height. The three wheel design with large sized front rollers gives it a stable state and it just stands when not being ridden. These are made from strong PU and ensure that the rides are smooth even on rough surfaces. It folds quickly and makes it easy for you to carry around wherever your kid goes. Why we like it: It is super affordable and the manufacturer gives 100% money back guarantee. This is yet another that brings quality together with affordability and many parents will love it for this very reason. It is a super light aluminum made toys that feels like a feather. It is a two wheeled toys that can be made into a three wheeled minutes. You can do it on your own following the instructions that come with the product. This means that as your child grows and learns to balance, he or she can try riding it with two wheels, the classic toy and games riding style. The folding handlebars and soft foam grips make it very comfortable. It does require a bit of assembly but nothing that will take a lot of time. Why we like it: It looks super cool as it has a graphical print all over the deck and bars. It comes in two color choices: green and pink. Both colors are in blue and large Kixi logo on the deck. Obviously, if it is Razor it is going to be fun and stylish. This one from High Bounce is jam-packed with quality parts and is for baby tots who are a little more passionate about riding on a toy. It has big disks made from premium grade PU. The rear wheel is quite wide and together all three can withstand rough surfaces without letting the rider feel a thing. The T bar is adjustable with the lowest height of 24 inches and the highest of 36 inches. This is clearly for older babies that want to challenge themselves and learn things quickly. It can stand weight up to 132 pounds thanks to its strong build. Why we like it: It is one of those toys that grow with the kid and that make it a good investment and value for money. The look also is very stylish with an all-black body and carved deck. There are other colors of course including red, blue and green. It is a great alternative to the walker as it is a mix of walker plus ride on. The seat is quite low so the toddlers’ feet easily reach the ground. With a little kick, they can go considerably fast and enjoy the ride. It is made in the United States and therefore has high-quality construction. It is recommended for children between 9 to 36 months. It has a storage area at the base for keeping any kind of toy. Why we like it: It has a little back seat for placing a stuff toy which looks super adorable. Toddlers are very attached to their stuffed toys and will scoot happily with them on their back. It is yet another cute feature from Little Tikes. It is a toy only that looks a lot like a bike. Strider is dedicated to producing products that improve the balancing ability of children. This is one such product with a sturdy steel frame and two large sized tires. It is good for children aged 18 months to 3 years old. The seat is designed for toddlers and is adjustable in terms of height. There is an integrated footrest too to make things easier. It is definitely going to be a challenge at first but after a while, the baby will master the smooth ride and balance impeccably. That is the whole point behind this bike inspired design. Why we like it: This scoot is different from others as it aids the development of toddlers and teaches them to balance. Baby tots love to learn things quick and it builds confidence in their very early stages. It tackles their fear of falling which is a great thing. While your little one is growing, the Globber Scooters 5-in-1 can begin introducing your child to scooting in the form of a ride-on seat, so mum and dad can push along. Once mastered, the T bar handlebar can be detached, forming into a useful pushbike, your child can independently have fun on. As you kid grows into the scooter even more so, and becomes more confident – they are ready to move on to the next stage! The Globber becomes a 3 Wheel Scooter, with adjustable height for your growing child. There are 5 functions to choose from in this scooter. Why we like it: To help your child even more, Globber have designed, and patented, a ‘Secure Direction Button Lock’, this moves the scooter in a straight line – just while your child is learning. Once ready for steering and moving, the function can be unlocked. A product licensed by Ferrari, it’s lighter then most popular brands. The handle bars are height adjustable for your growing kid of 5-8 years old. For children that love their cars, this scoot is easy turning, you can drift and accelerate to your hearts content! For more stable capabilities, there is a dual food platform and PU Wheels that can rebound. If you want to help your child improve strength and balance as they grow older, the Frog scooter is a great choice – especially for a Christmas Gift. The Mini Kick Vokul is special. With one big wheel at the front, this is the ideal starting point for your toddler. 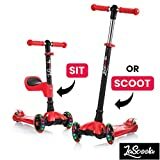 Your child can choose to sit on the scooter to kick, or stand and push it. The Vokul can support up to 100lbs of weight, and is ideal for 2-5 year olds. They won’t ever forget their Green Vokul! Try out the Vokul Mini for a smaller alternative. Why we like it: The Vokul 2-1 Big Wheeled Scooter is a bright green, you’ll feel reassured that you can spot your kid a mile away. We also love the stability that the larger front wheel brings, and the fact that your little one can choose to sit down or stand up. The Ancheer 3-in-1 is perfect for those who love to be the talk of the town! Your little one will stand out in this bright pink scoot, that also lights up – they will have so much fun. The adjustable handlebar has been designed to grow with your kid, and the seat is fully adjustable too. Built for little ones ages 2-8, and up to a weight of 110lbs. The LED lights add a funky effect to this cool scooter, that your tot is sure to love! The break is smooth, and safe for your child. Weighing only 5lbs, this scooter can be easily folded up and maneuvered. Why we like it: We think the Ancheer 3-in-1 is great fun! The colors are inspiring, and the LED lights are a nice touch. The practicality of this scooter, however, wins it for us. You are getting 3 different toys for the price of one – your kid will have endless amounts of fun. Fan of Ancheer? Try this awesome electric bike by Ancheer. The Wdtpro is unique amongst all the other 3-wheelers here. Why? Because of the two Rocket Sprayers with Sound and Light effects. This truly is a Scooter to be admired. With the 3-Wheeled design, the Wdtpro is stable for your child who may just be starting out. The adjustable handlebars can be altered from 24″ to 32″, as your child grows. Why we like it: As the winter months come in, you will be calm knowing that your child has the fun and safe rocket lights on the back of this Scooter. They will love them, and you will be reassured – it’s a win win! A practical, foldable, turnable AND Driftable Three-Wheeler says a lot about the Ancheer. It sounds fun, right? If you’re looking for a Christmas Present for your child, but want to help their health – the Ancheer Tri Wheel is a great gift to consider. The structure and function of the Scooter helps promote strength on the legs, body coordination, balance – and fun! Your kid won’t stop getting out and about in nature, with the help of this strength-inducing toy. Why we like it: The tri wheel design is flexible, and allows for more motion and expression in movement, while also being more stable than a 2-wheeler. The Ancheer is easy to stow away. Simply fold it up after use, and away it goes! The enhanced ABS Braking System has been designed with your little one’s safety being the main priority. A smooth, but precise stop will commence. For most of us, the idea of a toy is of a ride that has two wheels. For toddlers and babies, most of these types of scoot on games have three rollers. The position of the extra wheel varies from one model to another. However, most of them have two tires on the front. This is because toddlers need extra support and stability while pushing it. The wheels are usually made from tough materials like PU. There are some two wheeled toys as well but usually, they have the option to add a third wheel. Such toys are good if you want something that grows with your baby and once he or she learns to balance they can move on to a two-wheel scoot. The diameter of the roller on a scooter is generally 100 mm or above. Those that are considered large rollers are 120 mm or above. Large wheels are good for cruising and provide better rides on rough surfaces. These tend to go faster too as compared with smaller tires. When you are buying a scoot for your toddler kid, check out the size of the wheel, especially those on the front. The bigger they are the smoother the travel would be. Small rollers are optimized for performing stunts which is not the case for these very small children. Also, the wider the wheel the more stable the travel would be. For this reason, some models have a wide rear wheel to provide equal support on the rear end through the single wheel. This, of course, is very important considering a very small and lightweight baby is going to scoot it. Obviously, you would want the lightest toy you can find because it is easy for the baby to scoot and maneuver. The benefit is not just for the baby but also for you: the parent. You are the one who will have to carry it around places like parks or picnics. If it is heavy you will not be so fond of bringing it outside the house. On the other hand, heavy toys usually tend to be stronger. This is directly related with the weight capacity of the game. If you are getting it for a kid over 5 years, then perhaps a little weight will not be so bad. However, for any baby younger than that choose the lightest. Most of these tend to be light, some weighing as light as 5 pounds. Since these toys are made from very light materials to reduce its own weight, they have limited weight capacity. Most of them would be able to withstand a weight of 40 pounds. Some are very sturdy despite having light parts and can withstand weight over 100 pounds. This means that when your child grows they will still be able to scoot the toy. Make sure to check the maximum weight capacity because some babies tend to be heavier than other tots. These decks are not like the traditional decks on games and are generally quite wide. This is because toddlers need support and to provide that support the wheel deck is usually wide. They can even put both feet on when they are cruising as there is ample space. As a general principle, the wider the deck the more stable the travel would be. The deck which is lower is better for these tots as it amplifies support and stability and makes it easier for them to balance it. As for the length, it should be smaller for very young babies because then they will find it easy to kick it without any disruptions. As they grow, you can choose a longer length. The decks are usually made of plastic and some are still very sturdy. Many handlebars are adjustable and you can increase the height as your child grows out of one. If you are concerned about your child quickly outgrowing a toy then choose the one with this ability. For the most comfortable ride, choose a height that reaches the waist of your kid. They should not have to hunch a lot as that will affect their balance. On the other hand, if it is too high it will again be difficult to control and maneuver. Lean and steer is the way of steering the toy when the rider has to lean on the left to make it turn left or lean on the right to make it turn right. This is found only on toddler toys and is designed to give more support to a kid and develop their sense of direction. In the case of handlebar steering the handlebar is used for steering just like on regular toys. There is nothing negative about this steering mechanism. In fact, it will prepare them for the two wheeled ride they will take on later. It is more of a personal preference as to which steering mechanism method to choose. As a parent, you understand your child the most so choose whichever you think would make your kid’s smooth ride easy and stable. This is more of a help for the parent than for the toddler riding it. Children who are in love with riding a toy want to scoot it everywhere. This means that wherever you are going you probably will have to carry it along. If it is foldable it becomes all the easier for you to just fold it and carry it in your hands or stuffing it in the boot. The folding mechanism is usually very easy and quick. However, there is a chance that the toy might rattle especially when ridden fast. If you think you will not have to carry it around a lot then you can even get one without this mechanism. Toddler and baby games are very affordable and you can easily find something under $30. There are few expensive ones as well. The unavoidable truth is that at some point the child will outgrow it so many parents prefer buying a cheap one. Nevertheless, if your budget allows then, by all means, get the top one out there that has high quality. Perhaps, they might even run down to your other children. You can easily find accessories for the toy for your child. You can add grips although virtually all of them have grips already. You can add pegs if your kid wants to start doing some tricks. These toys are designed for toddlers so of course they are filled with colors and themes. You can find multitudes of colors for one model and some even have cartoons printed on them. Some have colors traditionally associated with girls so if you have a little girl, you can buy her one of those. Toddler toys do not look the same and you will find many style variations. This again is a personal preference and does not really have anything to do with its performance. As a parent, your child’s safety is your number one concern and naturally, you want to make sure that they do not hurt themselves in any way. When it comes to toys for toddlers, safety is also a high priority for manufacturers. For this reason, only, these games tend to be different from the one’s older children or teenagers ride. To address the issue of safety, these have wider decks and three rollers instead of two (some even have four). The wider deck ensures that your child gets a stable ride and can give them enough room to place both feet. These are also lower towards the ground so the kid does not have to push too much and is able to balance it easily. Similarly, the two wheels either on the front or back add more stability. These are also big sized to absorb any shocks from the surface your kid is riding on. The handlebar grips are also designed to be soft yet sticky at the same time so as to provide necessary support to the kid to control his or her ride. Additionally, you have to make sure that the kid wears a helmet whenever riding. This is even more important for newbies as they will be striving to learn to balance and will need the security that only a helmet can provide. You can easily find special scoot or bike helmets for toddlers online and some brands also have this as a side product. You should also teach them to be street-wise i.e. if they are riding on walkway they should stop in driveways. And they should not go on the street. Make it a habit for them and never leave them scooting outside unattended. Yes, a 2 year old is a toddler and can ride a toy. These scoots are designed for toddlers as young as 18 months and provide necessary support to help them learn to balance. Nevertheless, it is important to make sure that you check if the product is appropriate for the age of your child. Not all are designed for such young tots. Some have a height or weight that is appropriate for tots starting from 3 or 4 years of age. Obviously, for a 2 year old you should get the lightest toys you can get and the one with appropriate handlebar height that is suitable for your little one. You can find all these specs in the product details. You as a parent should help the toddler when they first start their ride. You can supervise them and teach them to balance the thing. For small children, these can be very beneficial too as they can teach them how to balance oneself and improve their physical movements. And of course, they will love the whole experience when they ride their colorful toys in the park or in the driveway. This is also one of the primary concerns of parents that perhaps they will have to replace a toy all too soon or their child would outgrow it. This is true that your child will outgrow it at some time but that should not happen very early. Many of these toys are designed for a decent age range so your child can easily ride for two to three years. Some have adjustable handlebar that further increases the age of the product for your kid. The handlebar is not the only limitation for the toys life. The toy itself plays a part too so if you get something that is not good quality chances are it will have to be replaced pretty soon. Babies can be a little rough with these things and it is hard to ensure that they do not damage it. Luckily, some brands have parts available that can easily be replaced and thereby removing the need to buy a whole new game. For instance, rollers can easily be found and replaced once they wear out. Also, these parts are very cheap so you will not have to spend a lot. If you buy something top quality, you will probably not have to replace it anytime soon. Designed for beginner riders developing balance and coordination. Wide base for better balance. My little girl is so happy with her 3 wheeled scooter I bought her. Thank you for taking the time to review these items Jason.